How do I curve grades in the New Gradebook? 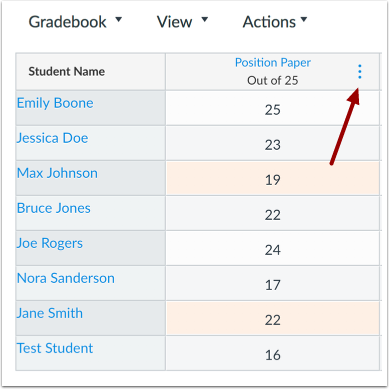 You can use the Gradebook to curve grades for an assignment. In the academic community, curving grades is advisable if only a certain number of students can pass, or when you require a fixed distribution of grades distributed throughout the class. 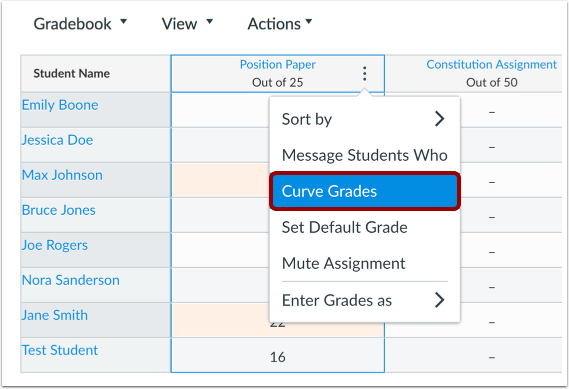 To curve grades, Canvas asks for an average curve score and then adjusts the scores as a bell curve 66% around the average score. For instance, if the average score is the equivalent of a C, Canvas would distribute mostly C- and C+ scores, distributing outward down the curve to Bs and Ds, and then ultimately As and Fs. This type of scoring creates a predictable distribution, but it means that students will compete against their classmates for scoring. 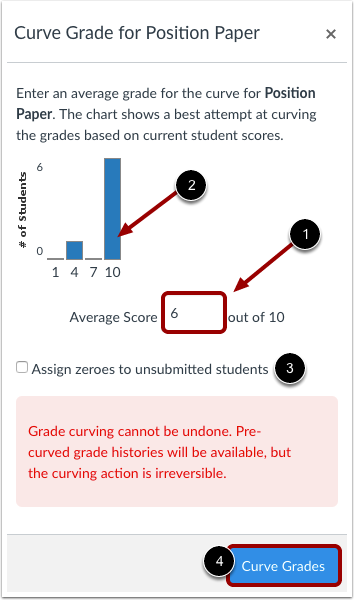 To learn more about how curved grades are calculated, view the Curving Grades in Canvas PDF. Grade curving cannot be undone. Pre-curved grade histories will be available, but the curving action is irreversible. Student grades will be impacted differently based on where they are in the distribution of scores. Perfect scores will not be affected by curving grades. When Multiple Grading Periods are enabled in a course, you cannot set a default grade for any assignment that has at least one student in a closed grading period. Hover over the assignment column header and click the More Options menu. Click the Curve Grades link. In the Average Score field , type the average grade for the curve score. The graph above the Average Score field will change depending on what score is entered and give you an approximation of what the new scores would look like . You can adjust the average score as necessary to produce a desired grading outcome. You can assign zeros to students who did not submit their assignments by clicking the Assign zeroes to unsubmitted students checkbox . To curve grades, click the Curve Grades button . Student grades will be impacted differently based on where they are in the distribution of scores. Canvas displays how many scores were updated. Click the OK button. View the new grades for the assignment. Previous Topic:How do I get to SpeedGrader from the New Gradebook? 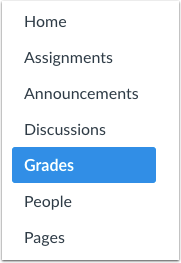 Next Topic:How do I set a default grade for an assignment in the New Gradebook? 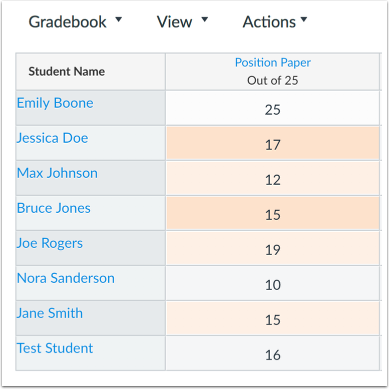 Table of Contents > New Gradebook > How do I curve grades in the New Gradebook? How do I set a default grade for an assignment in the New Gradebook?